Barn owls nesting in a grain bin is a good news / bad news situation. Yeah, another nest of barn owls reported in Iowa. Bad, because often times the owls are still using the grain bin when the farmer needs to use as well. This nest of four barn owls was in a bin that was scheduled for service and then to be emptied. The barn owls will finish growing at SOAR. A barn owl nest box was left with the landowner to put up near the grain bin once fall harvest is done. Thanks to Kelly in Crawford County for her assistance and to Alex for making the nest box for SOAR. 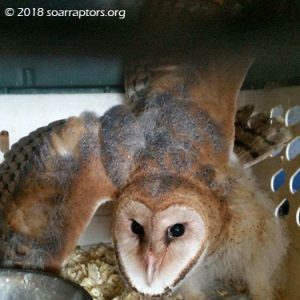 The two older barn owls were ready and were released at SOAR! The remaining two from this nest will be released come spring.